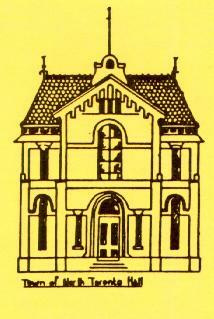 The North Toronto Historical Society is a volunteer organization which was established in 1975 as the Central Eglinton Historical Society. Its goal is to preserve the history of the area formerly known as the Town of North Toronto. 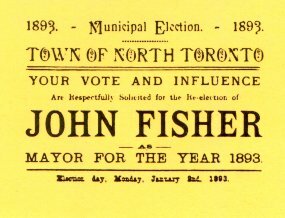 The Town of North Toronto was formed in 1890 from the unincorporated villages of Davisville and Eglinton. The village of Bedford Park joined in 1892. The Town existed until 1912 when it was annexed by the City of Toronto. The Town had its own schools, waterworks and police service. Click here to view the current meeting schedule. We explored the former village of Davisville with SERRA (South Eglinton Ratepayers' and Residents' Association). We discussed its people, farms, homes, industries and schools. Monthly meetings are co-sponsored by Northern District Library and feature a variety of topics relating to North Toronto and beyond. Walking tours are sponsored by the Society and at least one is held every year. Local history research, both of the area and of families in the area, is conducted by our members. In addition, oral history recordings have been made of early residents. Community outreach is facilitated by the Society's collection of photographs and slides. Speakers are available to address local groups. Publications covering the areas of our walking tours have been produced by the Society so that you can do your own tour. Members receive an informative newsletter four times a year. A tax receipt will be issued for donations of $10 or more (in addition to the fee).